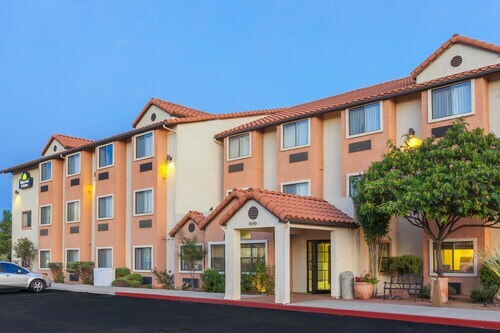 Located in the heart of Sedona, this hotel is 0.4 mi (0.6 km) from Tlaquepaque Arts and Crafts Village and 2.5 mi (4 km) from Chapel of the Holy Cross. 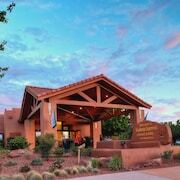 Bell Rock and Sedona Golf Resort are also within 9 mi (15 km). 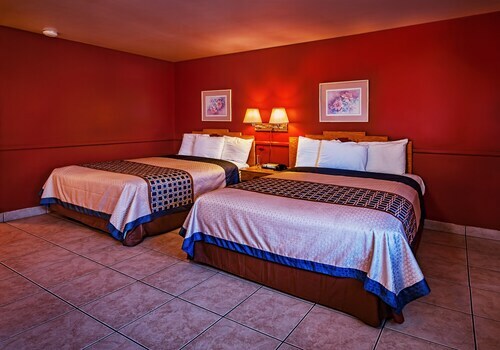 This West Sedona hotel is accessible to such outdoor activities as hiking, biking, and golf; Jeep tours and Tlaquepaque Arts and Crafts Village are 3 miles away; 2 Arizona state parks are within 7 miles. 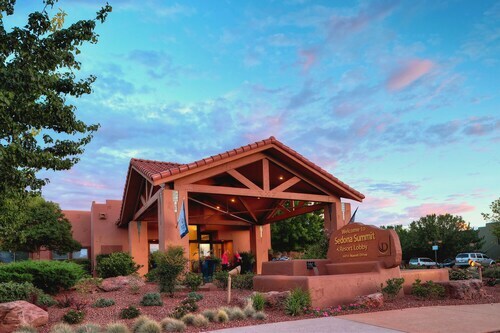 This family-friendly Sedona hotel is located near the airport, within 1 mi (2 km) of Kuivato Gallery and Sedona Art Center. Chapel of the Holy Cross is 3 mi (4.9 km) away. Located in West Sedona, this hotel is 0.8 mi (1.3 km) from Amitabha Stupa and within 3 mi (5 km) of Coffee Pot and Sedona Art Center. Sunset Trail and Sugarloaf Mountain Trailhead are also within 2 mi (3 km). 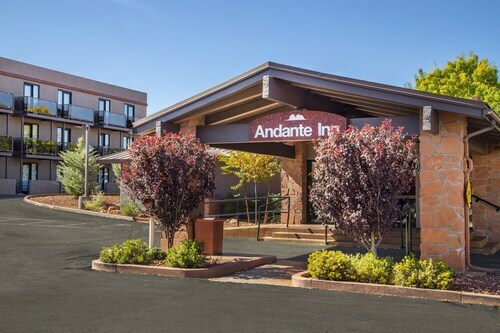 Located in West Sedona, this hotel is 1.2 mi (2 km) from Amitabha Stupa and 2.7 mi (4.3 km) from Coffee Pot. Sunset Trail and Sugarloaf Mountain Trailhead are also within 2 mi (3 km). 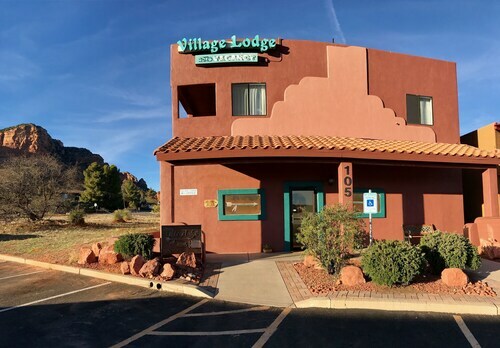 This motel is located in Sedona (West Sedona), near the airport, Amitabha Stupa, Coffee Pot, and Sunset Trail. Local attractions also include Sugarloaf Mountain Trailhead and Crescent Moon Ranch. 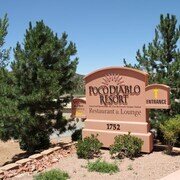 Situated in Sedona, this hotel is 1.1 mi (1.7 km) from Bell Rock and 1.5 mi (2.4 km) from Sedona Golf Resort. Cathedral Rock is 4.4 mi (7.1 km) away. Majestic red-rock pinnacles and buttes shelter this leafy oasis located in the heart of Uptown Sedona, Arizona. Located in Uptown Sedona, this romantic hotel is within 1 mi (2 km) of Kuivato Gallery and Sedona Art Center. Mountain Trails Galleries and Tlaquepaque Arts and Crafts Village are also within 1 mi (2 km). 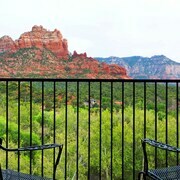 How Much is a Hotel Room in Sedona? 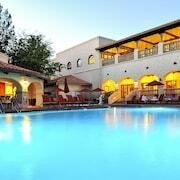 Hotels in Sedona start at $99 per night. Prices and availability subject to change. Additional terms may apply. 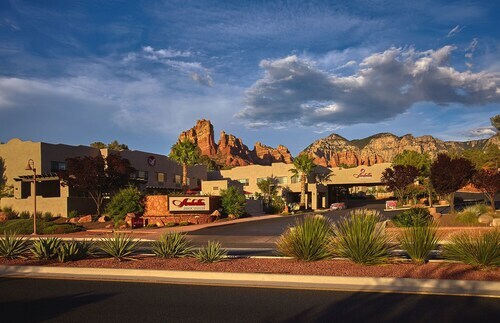 For a refreshing vacation in a stunning natural setting, check in to one of the Sedona hotels, where you can enjoy red rocks and the beauty of the Arizona desert. Whether you love arts, culture, or outdoor recreation, you'll have multiple activities to put on your itinerary. Enter the quirky, colorful vortex that is Sedona, Arizona, and you can’t help but emerge changed. Whether it’s gaining the inspiration from so many free-spirited local artists or the awe of monumental red rock mesas, there’s just something about this place that clings to the soul and stays with you long after you leave behind those vibrant desert sunsets and rich landscapes. 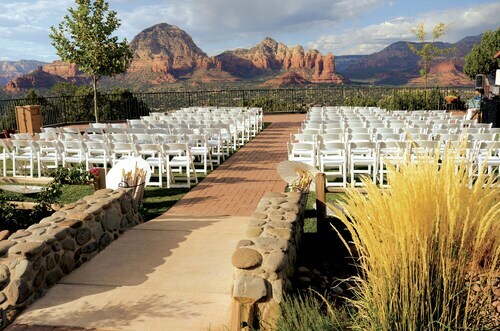 Soak it all up from the comfort of Travelocity’s Sedona hotels, or go out and have the adventure of a lifetime. It’s all up to you. Your aura says you need a vacation. 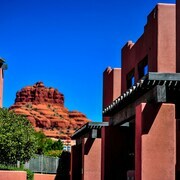 What will it say when you arrive at our hotels in Sedona? We’ll leave that to the local psychics and metaphysical shop owners. Here you can pick up energy crystals, have your palm read, or renew your chi. The vortices in the Earth’s magnetism are said to have special healing properties. You can find them at Boynton Canyon, Airport Mesa, and Schnebly Hill. Even if you’re not ready to give up your medical plan just yet, get some exercise by hiking or mountain biking to Cathedral Rock, The Devil’s Bridge, or Bell Rock. Wake up at the Sky Ranch Lodge and climb aboard a small plane to get a hawk’s eye view of the Coconino National Forest. 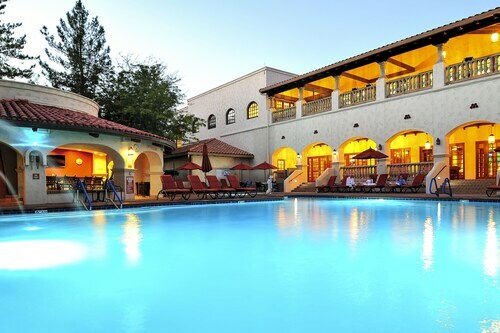 Or stay at Arabella Hotel Sedona in the city center to be close to a vortex of gourmet restaurants and nearly 100 different art galleries before a relaxing day of golf or pampering at the spa. Will it be the surreal landscape, resort amenities, or vortices that help you find your Zen? Only a visit to the area will tell. 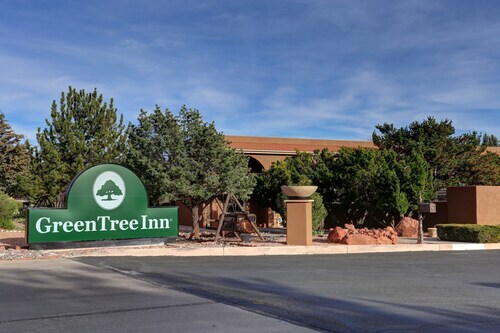 Book a cheap Sedona hotel with Travelocity, and who knows? You could find your center before ever stepping on red rock. Namaste. Need insider tips on must-see attractions in Sedona? Check out our Sedona travel guide! Next to hiking trails that are wonderful. The view of the mountains are spectacular. The staff is very knowledgeable about the sites to viewand go above and beyond to help. The hotel has a court yard thst attracts hummingbirds. Has fire pits within. Excellent hotel. Mrs. Shanin st the front desk was great..we will stay there sgain when returning. Amazing location and those views! We were pleasantly surprised by the views from our room and being so close to where everyone watches the sunset. The hotel was in close proximity to where he hiked and had dinner and any other activities. The front desk staff was very helpful and the friendly cat Atticus was a nice addition. The rooms are spacious and comfortable. I would highly recommend to family and friends. It makes for a beautiful event venue (when we arrived a wedding reception at sunset was in full swing). 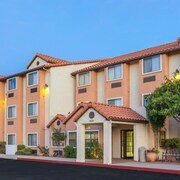 Clean rooms, convenient location, exellent servces! Very pleasant place to stay. Pool and hot tub were great.